Discussion in 'Research News' started by erik, Jan 23, 2013. Researchers from Harvard Medical School regenerated some crucial "hair cells" in the inner ears of mice and restore noise-induced damage to some extent. Their findings were published in the Jan. 10 issue of the journal Neuron. The drug, which goes by the natty name of LY41175, allows other cells in the inner ear to change into hair cells. Normally, these cells are inhibited from making the switch. LY41175 releases that inhibition by interfering with the activity of a protein called Notch. In mice with noise damage, scientists found putting the drug into the middle ear and allowing it to diffuse into the inner ear increased numbers of hair cells in parts of the inner ear and, in step with that, increased the rodents' ability to detect sounds that matched up to those parts of the inner ear. The effects lasted for at least three months, the longest period of time that the scientists tested. Anyone who’s gone to too many rock concerts or worked with loud machinery for too long (or listened to too many kazillion-decibel advertisements at a movie theater) may eventually pay the price: hearing loss caused by damage to tiny, sound-transmitting cells in the inner ear. Researchers now report they can regenerate some of these crucial “hair cells” in the inner ears of mice and restore noise-induced damage to some extent. It’s something that hearing scientists have been hoping for ages (though we will avoid using the term “holy grail”). The experiments, by Albert Edge of Harvard Medical School and his colleagues, were publishedin the Jan. 10 issue of the journal Neuron. Our ability to hear goes this way: Sound waves enter the gristly outer ear, travel down the ear canal and then buffet up against the eardrum, causing the drum to vibrate and jostle three bones in the so-called middle ear: the hammer, anvil and stirrup. The stirrup, in turn, presses against a membrane that divides the middle ear from the fluid-filled inner ear. The fluid in the inner ear then moves, causing arrays of tiny sensory cells called hair cells to wave about and send signals to the sound-processing parts of the brain. Based on the frequency of a given sound, hair cells at different points along the inner ear will activate. Our brains interpret the signals from those different points in the inner ear as different frequencies of sound. Loud noises, among other noxious assaults, can damage the fragile hair cells. That’s why habitual exposure to loud noise or one-off insults such as close-range gunshots or explosions can damage our hearing. The cells, once damaged, don’t regenerate -- not in mammals, anyway. (They do in fish and birds.) But Edge’s team showed they could coax some hair cells to do so in adult mice if they were treated with a certain drug. Even with good hearing you may still have some loss in areas not recorded by standard tests. I have had numerous test and told my hearing is perfect on standard test. My high frequency test was also good but show slight loss around 13k. That is only explanation I have for my tinnitus as my hearing is perfect on normal tests but still some loss there on the very high end. My high frequency test was also good but show slight loss around 13k. If anyone is interested I got the full PDF of the research study. I alway thought my tinnitus was extra high frequency. Confirmed by an audiogram that showed my hearing went down at around 18 khz. I was totally wrong. By fMRI my main tone was measured at 8300 hz. I don't see my text when i edit so i will double post. Sorry. As Erik said classical audiograms are very limited. Their frequency resolution is very crude, if you have a loss between 1050 and 1090 hz no audiogram will see it. And most hearing tests don't go farther than 8 khz while our hearing goes up to 20-25 khz when we are young. These audiograms are good enough to aid audiologists to set current hearing aids but that's all. There are audiograms with a frequency sweeping that are much more precise. Instead of setting a frequency and raising the sound volume until the patient hears something, they set a decibel volume and sweep frequencies. EDIT: ok, i see it. I should have clicked on "more options" while editing. One of the commentators on that video stated the pharmaceutical company that researched and, of course, owns the patent to, has no plans to peruse this drug for hearing loss. It was a botched Alzheimer's drug that had another effect. Kind of like Rogaine was originally a blood pressure drug. Every time I come on here I see new technology or drugs that can help us pretty much being buried. It's very depressing. Hmm... Googling 'LY41175' gives results, where you can buy the chemical. On 'http://xcessbio.com/index.php/small-molecules/ly411575.html' they actually tells you the oral dose they gave the mice in the experiment. Edit: Erhm... I should probably say: 'please don't try this at home'. Just wanted to share that the drug apparently is not so 'codenamed' anymore. LY411575 is a highly potent, selective, and orally bioavailable inhibitor of gamma secretase. 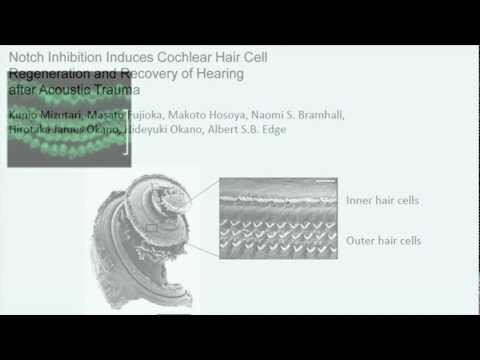 "Systemic LY411575 administration increased hair cell number and promoted hearing recovery in a noise-damaged cochlea, but local LY411575 administration promoted hearing recovery through transdifferentiation of supporting cells into hair cells after noise-induced hearing loss in the mature cochlea." To get the equivalent dose, I (a 160 lb person) would have to take 35 mg per day orally. Lol, that's nearly the entire 750 dollar 50mg purchase. It would be an expensive experiment! I think it would be a lot cheaper to try and get a doc to prescribe you retigabine off label for your tinnitus if you really want to be a lab rat. I think it would be unwise to assume a laboratory chemical that has not even passed a clinical trial does not either, lol. Anybody here tried Retigabine for T? To my knowledge, no. I have asked that question in the thread dedicated to the Pittsburgh Retigabine study. I believe a guy on the forum knew a vet who was going to ask for the medication, but I don't know how that panned out. I think the medication is pretty expensive if you don't have prescription drug coverage too. Any news on this? Any trials about to start or something? It seems as though the researchers responsible for this have started a company called Decibel Therapeutics and it seems to be very well funded as well. Hopefully we will see some things happening with this in the coming years. Yes, this company might bring us some glimmer of hope. These people involved here are really important researchers with a very valuable experience. I guess, they are doing similar research as Audion Therapeutics does, but better funded. So let's hope to get some news. I keep hoping for good news, but wow, the first post was 3 years ago. These things really do move slowly. I keep hoping for a cure to hearing loss my lifetime, but I'm not sure that is going to happen. Even if they can perfect this, its about 3 years or so of clinical trials, and they havent started yet. I will keep hoping and it is good news that the company is now being funded and will start hiring people to continue the research. Yes indeed in reality research always looks slow but in fact they are working everyday very hard to get more and more advance in understanding the inner ear. I remember back in 2003 there was a wall street transcript from Sound Pharmaceuticals estimating hair cell regeneration in 2015. But their regeneration programm is for IND in 2017. So in this case they were at least 15 years wrong. In the other hand they claimed their cure from one of the first discoveries concerning hair cell regeneration. Inbetween, in the last 15 years many labs and biotech companies released some new discoveries and with Genvec/Novartis we have the first human trial from a discovery in 2005. Not bad at all. I was always aware that the cure is not arround the corner, but the fact that there is research and a perspective always let me feel better. Even there is still not a single specific drug or treatment for inner ear disorders on the market, we have many products tested right now,and it looks like more to come. Hearing Science never looked better than today. I'm also happy, that this research get more and more attention. Hi @tomytl . I don't understand what you mean with "15 years wrong". And this is not the case, because it's still in preclinical state and for IND in 2017. I don't want blame them for their visionary interview in 2003. I think there must be something that is clinically applicable behind this research taken out at university if private companies are being established. This reminds me of an article in the Dominion Post in New Zealand where I was at the time. In February 2005 they quoted from the Loss Angeles Times. "Researchers restored hearing in deaf animals for the first time by inserting a corrective gene with a virus in the cochlea to induce the formation of hair cells." The article was closed with stating that it would be at least a decade before the technique could be tried in humans. We all know that Genvec/Novartis started this trial in humans in 2014. So this was one prediction that was quit accurate. But the more I read about the challenge the more I understand the complexity. I wish we could do a copy and paste using the mechanism in birds. I suppose this is, in a very crud way (at the moment), what science is trying to do. And human hearing and comprehension/interpreting can not be compared with birds.